Macaws exhibit some of the showiest feathers. 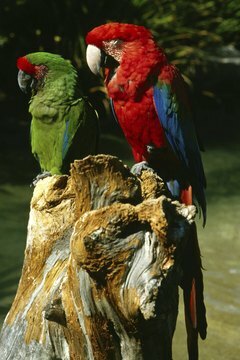 Colorful and intelligent, parrots are prized for their personalities and fascinating ability to talk. Native to tropical and subtropical regions, parrots are social and interactive with their humans and might be smarter than you think. Although small when compared to intelligent mammals such as apes, elephants and dolphins, a parrot’s brain is highly developed and efficient. 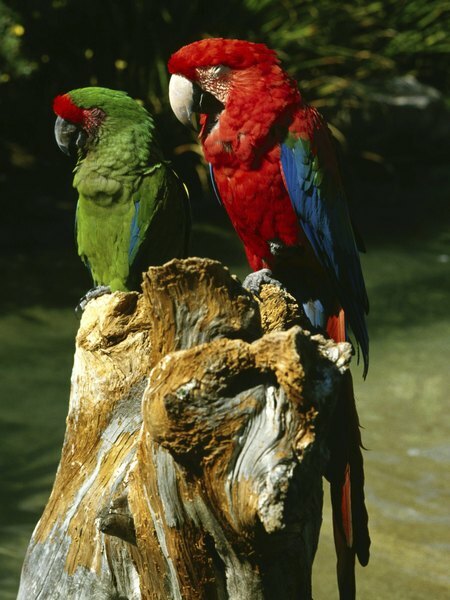 Flight navigation, language, social relationships, problem-solving and adaptability are abilities that all parrots possess within their small-but-powerful avian brain. Alex was an African gray parrot who was studied extensively animal psychologist Dr. Irene Pepperberg. With a vocabulary of about 100 words, Alex could label objects and colors and had a rudimentary understanding of numerical concepts. Dr. Pepperberg’s experiments concluded that Alex was not just mimicking language by rote, but that he actually understood the concepts and even created a few words of his own. She compared Alex’s intelligence to that of a 5-year-old human child. The ability to use tools is often considered a measure of intelligence in animals. The palm cockatoo, a parrot native to Australia, beats a stick on a hollow tree to show his prospective mate that he owns his own home and she can move in. A parrot’s beak is an effective tool in itself. Using the beak, a parrot can peel the skin off a grape or crack open nuts or seeds. In Australia, wild cockatoos have been reported disassembling the screws from microwave towers. Whether they’re just amusing themselves or exercising their beaks isn’t known. Object permanence is the idea that objects exist even if you can’t see them. Humans are not born with this understanding, but develop it by 2 years of age. A young parrot named Griffin has been extensively tested for this ability. At the age of 21 weeks, he showed an understanding that an object removed from his sight was still there, and by 52 weeks, he was fairly adept at the “shell game,” and could retrieve an item hidden in a box even when he didn’t see the researcher place it there! MAARS: Parrot Intelligence: How Smart is Smart?